Some time ago I wrote about Tools for Stochastic Drumming and I would like to give a short update and a quick tutorial how xoxos’ circuit can be used in Ableton Live. First the tutorial. I found the solution with the help of the kvraudio forum. An interesting source of information, so I recommend to check it out. The volume of information is a bit intimidating at first, but I think it’s worth you time. 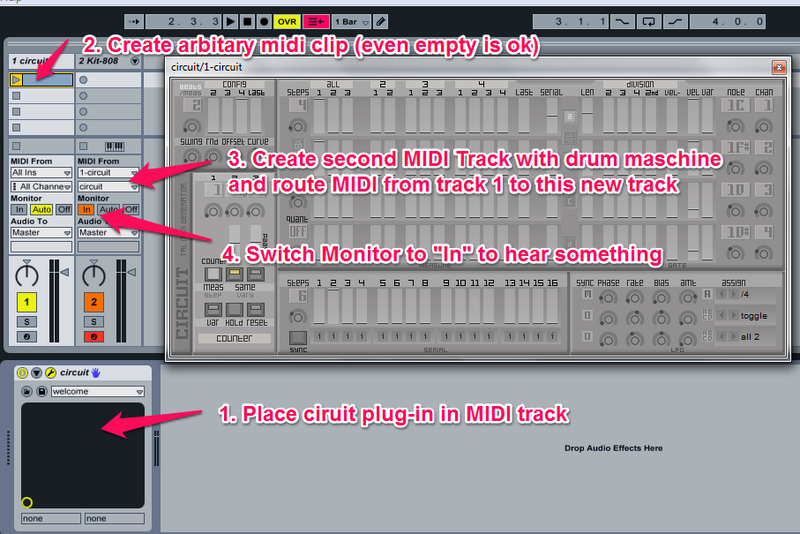 Create a new MIDI Clip into the track created in step 1, for example by double-clicking into the slot. And yes, the clip may be empty. Circuit seems to be ok with a play/start event it doesn’t need a MIDI note. Start playing the clip and you should hear sound. If you still having problem with it, let me know. I’m happy to help after I had some hard times figuring it out, too. So, to the second part: What’s up with the other tools. Well, not much. My iPad app “Stochastik Drum Machine” by “xitive” is still waiting for the promised MIDI update. Because it was planned for 10/2012 I gave up the hope that it will be coming at all. This is bad, because I like the interface but audio alone just don’t cut it for me. For stochastic drumming MIDI rules over audio. I’ll keep you updated on this, but it seems that I don’t have to program my own tool, which is sad and cool at the same time (quicker results, but no chance to learn about JFuge).